We bought the DC Range of table, stacking chairs and storage from O'Driscoll Furniture in 2003 for our home in Kilkenny. We placed it in a large open plan kitchen where it became the centre of family life. The table and chairs are a wonderful classic, timeless design and so well made. They are excellent examples of quality Irish design and craftsmanship. In May this year we moved our Irish base to an apartment in Dublin. We were reluctant to part with the table so I approached Simon O'Driscoll about giving the table a new 'whitewash finish' to compliment the white wash floor and grey/neutral colour scheme of this modern apartment. Simon brought me a few samples to see what the finish would look like in situ and then whisked the furniture away for its makeover. I am delighted with the outcome and pleased that my family will continue to enjoy gatherings around this range. O’Driscoll furniture worked with Opperman Associates in developing “refectory style” dining tables and chairs in Dublin City University and loose bedroom furniture (sofas, tables, desks and chairs) at the Louis Fitzgerald Hotel. We were delighted to be able to specify the developed version of the DC Chair and refectory table many years later in the Buttery Restaurant in Trinity College. It’s had remained timeless and contemporary and more importantly had stood the test of more than ten years use extremely well. We believe in ensuring that the right company or person is used for the right job. 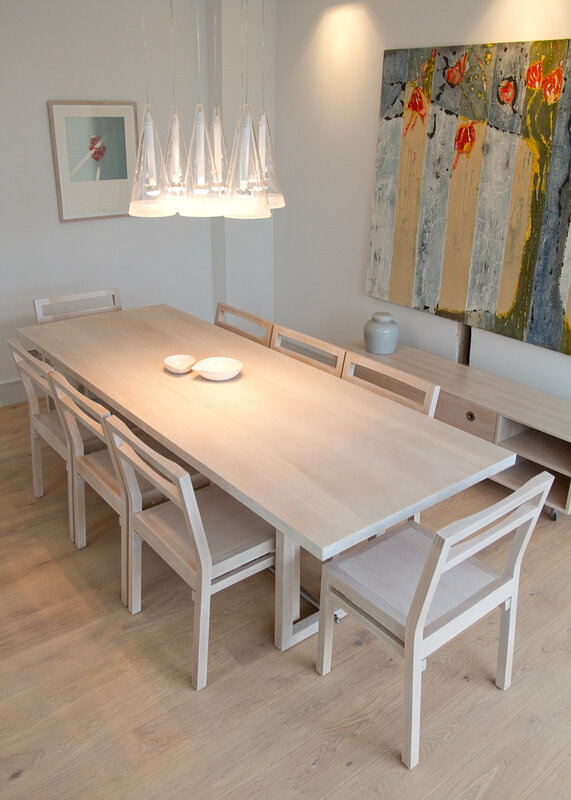 As Architects we design many things - but when it comes to bespoke fitted and loose furniture we believe we need the help of people who know how the ergonomics of a chair works or how best to put beautiful pieces of timber together. O’Driscoll Furniture have brought technical expertise to bear in developing out initial concepts into high quality pieces of furniture. O’Driscoll Furniture bring unparalleled design excellence and sophistication to every project on which we collaborate. The quality of design, attention to detail and service that O’Driscoll Furniture brings to a project is unique. We have no hesitation in recommending O’Driscoll Furniture. O’Driscoll Furniture successfully worked with us in delivering a design and installation of Oak and Steel Beam Seating Waiting Area furniture in a HSE Primary Care Centre in Ballymun for our client. O’Driscoll Furniture were meticulous in detail and assisted in preparing mock-ups to achieve a good balance of excellent ergonomics and seating capacity in a visual striking design. We have no hesitation in recommending O’Driscoll Furniture for high quality furniture installations. Simon O’Driscoll art form - 'Spine Bench' is a wonderful example of contemporary Irish furniture design at it’s best. A beautiful combination of materials that sit well in this elegant and well-designed bench. It is comfortable and practical but at the same time a timeless and excellent addition to an exterior space. I bought the DC table in 2005 for my newly refurbished kitchen from O' Driscoll furniture. Besides its many functional uses it is a pure pleasure to look at and is a work of art. I recently called Simon to have it revarnished and reconditioned and was very impressed with the personal service I received and the care that was taken by him and his team in doing so. I love my DC table! What first attracted us to the DC table and chairs was its classic simplicity and clean lines. We felt it was a piece that wouldn't date and that we would be happy to have in our home for many years. The table is literally and figuratively at the centre of our home. It is used for everything from homework, arts and crafts, everyday dining and large family gatherings, has withstood a lot of battering over the last three years and still looks great! We were working on the design for the new Cliffs of Moher Centre in Co. Clare in 2004. One of the main challenges was that we were using a Liscannor stone floor, which is pretty uneven, and we were expecting 1 million visitors a year. The combination meant that we needed to specify a Chair that peformed to BS Contract Level 4 which is hard to find and ideally made in Ireland . We were very lucky to find Simon & Tadhg who designed the DC Chair and which exceeded our exact performance level (BS Contract Level 5). It’s hard to find good designers who manufacturer and supply at this level. To my knowledge we have never had a problem with the chair. I would have no hesitation in recommending Simon O' Driscoll and the DC Chair.